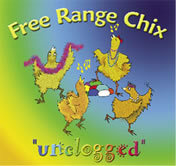 Singing a slightly different tune these days, the FREE RANGE CHIX are back in the coop. In other words: due to family obligations, and the temporary cyclical economic situation curtailing many artistic endeavors,the CHIX are hibernating, hydrating, hyperbolically hyperextending our hiatus. THANK YOU FOR YOUR PATIENCE AND THE MANY ENCOURAGING WORDS FROM SO MANY OF OUR FRIENDS!